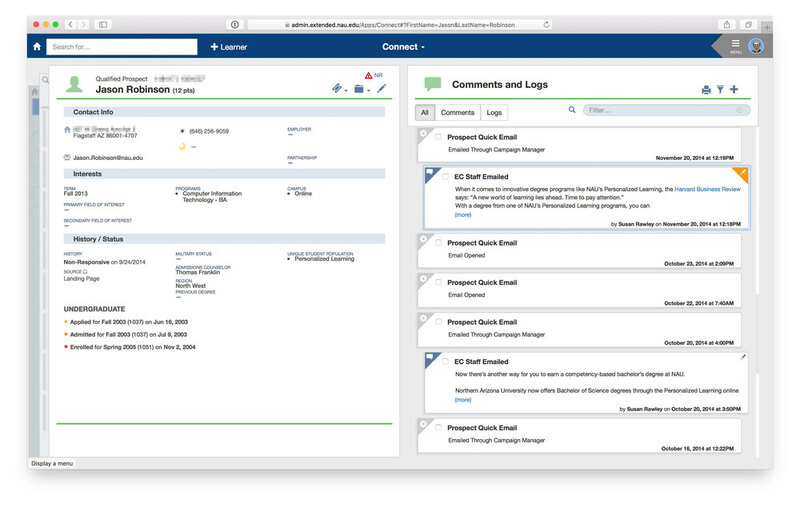 Connect is a custom-designed Customer Relationship Management (CRM) tool that allows us to follow prospective students from their very first expression of interest in NAU all the way through to enrollment. It allows staff who interact with prospects or students to see what actions and conversations have taken place in the past, pull reports, and offer better service while increasing conversion and retention. As so often happens, a feature built with accessibility in mind actually benefits everyone. Connect is built on the mental model of a stack of cards. This quick-navigation bar reinforces the user’s current place in the “stack” and allows users to rapidly shuffle between cards as needed to view different information or begin a new search. The entire application is keyboard-accessible, which makes it incredibly fast to navigate.